ISLAMABAD: After agreeing to hold a debate on the alleged rigging during the general elections that were held on July 25, Senate decided to postpone the discussion till Friday owing to lack of quorum besides passing a Senator Raza Rabbani’s resolution to make enforced disappearances criminal. As Senate Chairman Sadiq Sanjrani is in the hospital due to his ill-health, Deputy Chairman Saleem Mandviwalla was chairing the session. He admitted the adjournment motion of Senator Muhammad Javed Abbasi over alleged rigging after it went unopposed by Advisor to Prime Minister on Political Affairs Dr Babar Awan. In support of his motion, Senator Abbasi said the observers and international organisations agreed that the elections were the “most rigged” in the history of Pakistan in spite comprehensive measures by the government to make the Election Commission of Pakistan (ECP) an independent body through various legislation. But the election watchdog still failed to perform its responsibility, he said, adding the issue was related to the whole of Pakistan and it should be discussed by the senators in detail. However, the motion was adjourned Leader of the Opposition Raja Zafarul Haq intervened and said the government and opposition both agreed that this was the “most important issue” while requesting its postponement till Friday as a number of senators and minister were not present in the house. As the issue of the missing persons continues to haunt the government, the upper house of parliament passed a resolution urging the government to immediately enact legislation to criminalise enforced disappearances. The resolution was moved by former Senate chairman Raza Rabbani to mark the international day of victims of enforced disappearances. The resolution also asked the government to join the international campaign to end enforced disappearances by ratifying the international convention on the protection of all persons against enforced disappearances. It expressed solidarity with the families of missing persons and those who are victims of enforced disappearances and assured the families of disappeared persons that the upper house will be their voice in ensuring justice, recovery, and punishment to the perpetrators. Responding to the points of Raza Rabbani regarding National Finance Commission (NFC) Award, Leader of the House Shibli Faraz said that the government desires early announcement of new National Finance Commission award as it has already faced delay. He said that the finance minister himself has stated that the new NFC is the priority of the government. On a point of order, former leader of opposition Sherry Rehman regretted that parliament and relevant stakeholders had not been consulted regarding the decision to form a new regulatory body replacing PEMRA and the Press Council of Pakistan. The leader of the House Shibli Faraz responded the PTI government believes in transparency and everything will be done in accordance with the law and constitution. Further, the house was informed that as many as 6,450 Pakistanis are imprisoned in Gulf countries and a holistic approach will be adapted to provide full assistance to the Pakistani prisoners languishing in foreign jails. Minister for Human Rights Shireen Mazari told the house during question hour that consular services of our missions abroad will be upgraded for this purpose. She said a policy decision will also be taken to get in touch with different countries for repatriation of Pakistani prisoners. The minister said the present government will bolster efforts to produce skilled workforce keeping in the view the demand of jobs in the Gulf and other countries. Adviser on Parliamentary Affairs Babar Awan told the house that Gwadar port is a big national asset. He said currently limited exports and commercial imports are taking place from the port. In a written reply, Foreign Minister Shah Mehmood Qureshi told the house that safeguarding national security, promoting Pakistan’s economic interests and strengthening international partnerships have been some of the overarching themes of country’s foreign policy. He said the foreign policy as in any other democratic country is formulated by the government. However, the parliament, security agencies, and some other ministries play an equally important role in providing crucial inputs, he said, adding, this practice is also followed in other countries as well. The acting chairman also admitted the adjournment motion of Senator Mian Ateeq Shaikh regarding the fake clinics and dispensaries operating in rural areas increasing fatality rate in the country. Senator Ateeq said Pakistan had the problem of fake clinics due to non-availability of proper health facilities. The provinces should be taken on board and the policies in this respect should be implemented. He said action should be taken against quacks. Mandviwalla referred the matter to the relevant committee and asked the mover to get passed a resolution so that the matter could be taken up with the provincial governments. Senator Sardar Muhammad Azam Khan Musakhel presented reports on privilege motions moved by Senator Azam Khan Swati, Senator Mohsin Aziz and Senator Dr Jehanzeb Jamaldini on breach of their privilege by different government functionaries. Due to absence of Finance Minister Asad Umer from the house, the chair deferred the calling attention notice of Senators Raza Rabbani, Sherry Rahman and Dr Sikandar Mandhro on the demands raised by a delegation of Financial Action Task Force (FATF) during its recent visit regarding expeditious implementation of the recommendations agreed by Pakistan and the implications of FATF report on Pakistan’s greylisting. The Senate was informed that corruption and malpractice had decreased in the Pakistan Railways during last four years. However, Minister for Railways Sheikh Rashid told the House that the deficit of the railways was Rs30.5 billion in 2013 and it had reached Rs41 billion in 2018 and there was a case of 1800 inferior quality hopper wagons, 58 Chinese locomotives while 30 of them were useless, all procured through single bidding. He said there was a major case of 55 engines from the United States twice at the price of what India had purchased. Meanwhile, joint opposition marred the Senate proceedings with two back-to-back walkouts, one over remarks of Minister for Railways Sh. Rashid Ahmad, forcing the acting Chairman Salim Mandiwala to adjourn the House till Thursday. 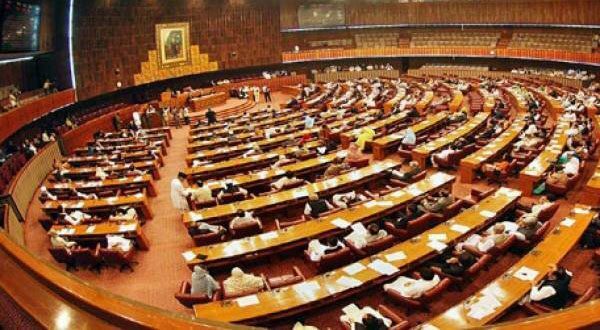 The opposition senators staged the first walkout from the House during the question hour to agitate remarks of the Minister for Railways, which were expunged along with those, made by PML-N Senator Ch Tanvir Khan against the minister.